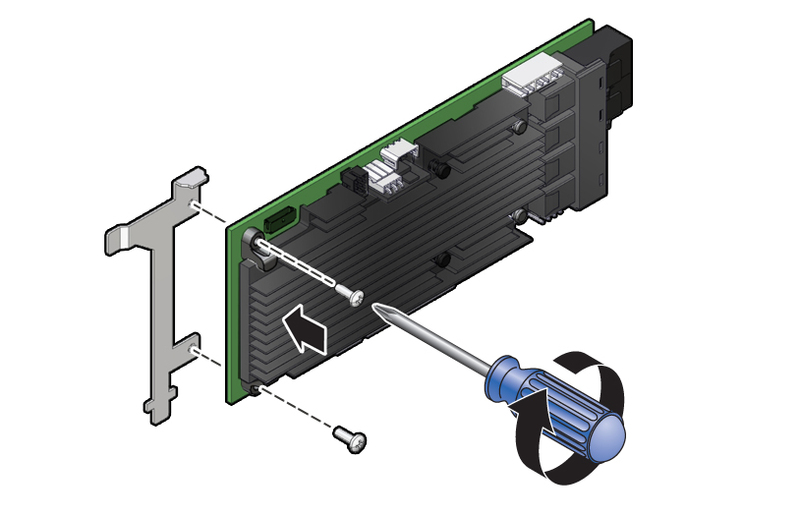 Unpack the replacement host bus adapter (HBA) card, the SAS cables, super capacitor, and the super capacitor cable, and retrieve the PCIe riser for slot 3. Using a No. 2 Philips screwdriver, remove the standard HBA bracket that shipped with the replacement HBA card. Install the special fitted bracket that was removed in Step 4 in Remove the Internal HBA Card and HBA Super Capacitor. 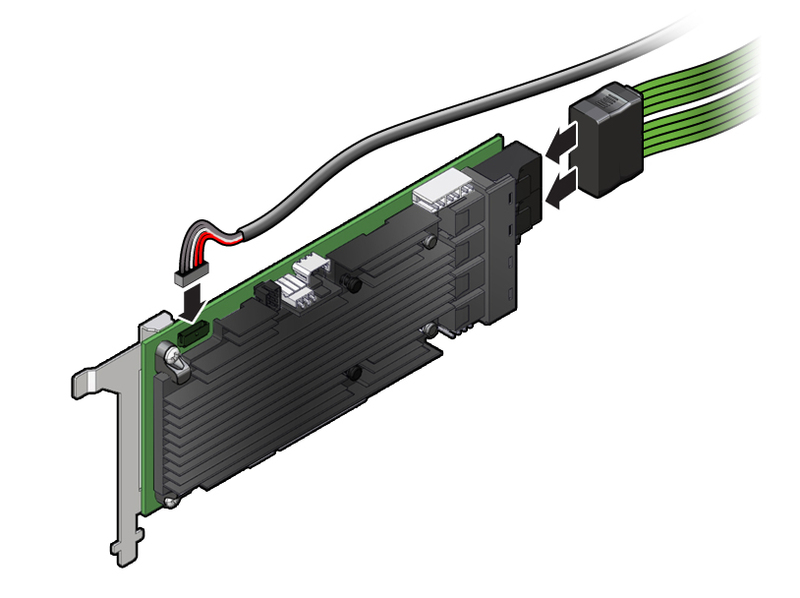 Carefully guide the SAS cables and super capacitor cable that connect to the disk backplane and the super capacitor through the left-side cable trough. Install the super capacitor into the server. Attach the reclosable fasteners supplied with the replacement super capacitor to its underside. Connect the super capacitor cable to the super capacitor [1, 2]. Press the super capacitor into the server's chassis so that it is secured to the existing reclosable fastener . Note - If disconnected during the removal procedure, reconnect the data cable to the disk backplane. Connect the SAS cables and the super capacitor cable to the internal HBA card. 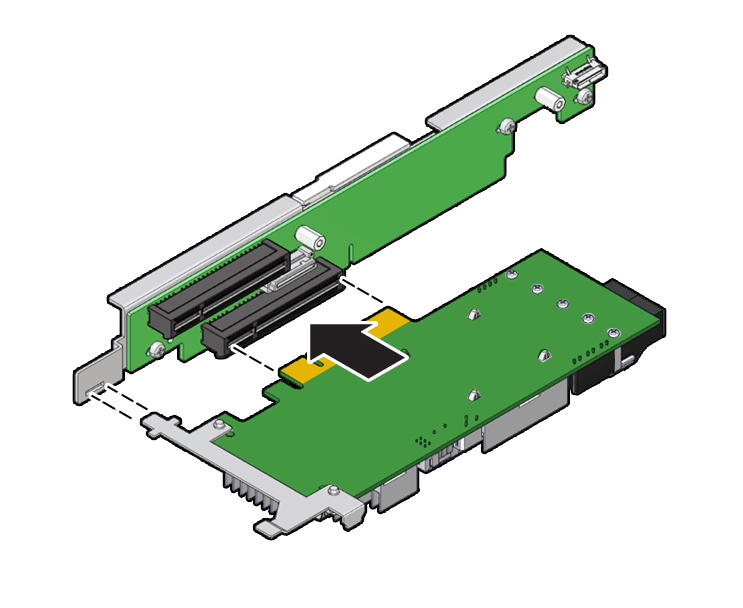 Insert the internal HBA card connector into the bottom connector on the riser for PCIe slot 3 and 4. While inserting the HBA, ensure that rear bracket on the HBA card fits into the connector slot on the PCIe riser.